This is a short post to introduce you all to a great service called SHERPA/RoMEO, run by the University of Nottingham. It describes itself as, "...a searchable database of publisher's policies regarding the self-archiving of journal articles on the web and in Open Access repositories." Basically, you search for a journal's name, and it explains their exact publishing and copyright policies. The results are clean and easy to follow, and should absolutely be used by researchers to help inform them where to publish. You can see that Neuron doesn't have the greatest policies, but you can pay extra to publish your paper as open access (which wasn't available when I published my paper in 2010, I believe). 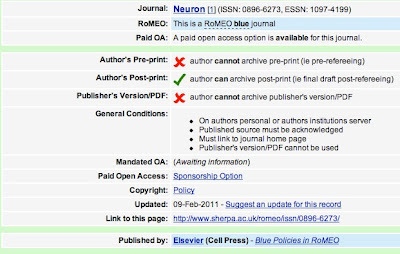 I learned about SHERPA/RoMEO via a question on Quora that I asked Mendeley's Head of Academic Outreach, William Gunn, to answer: "Are there any peer-review journals that consider posting results on the author's blog "prior publication" and thus ineligible for publication in their journal?" He provided a very solid, useful answer, and introduced me to this fantastic service. So thank you, William! Bookmark this one folks. It's very helpful. "You can see that Neuron doesn't have the greatest policies, but you can pay extra to publish your paper as open access." Actually, not so much. See my recent article Pay to download Elsevier’s “open access” articles, plus the previous five installments that are linked from it. Elsevier's "open access" offerings are a mess and a disaster.